Purpose of this page: To share information with other plastic surgery or cosmetic minded practices regarding open houses. Our first open house had 235 people come through. I’ve decided that was too many people, and have since come up with strategies to focus the open house to have fewer people. We are 2 doctor, husband-wife, plastic surgery practice located in Modesto, CA specializing in Plastic Surgery, Cosmetic Injections, Veins, and Acupuncture. My wife and I became a team when we met as part of the Program in Liberal Medical Education (PLME) at Brown University. My wife, Dr. Tammy Wu, eventually graduated top of her class with the award for highest grades among the women doctor graduates of that Brown University program. I on the other hand, as a violinist, had the fortunate experience of being the concert master of the Orchestra and a two time winner of the concerto competition at Brown University (had to add something in there so I didn’t sound too shabby in comparison). We also helped to start a marthon in Modesto, California called the Surgical Artistry Modesto Marathon – how exciting. We are now getting ready for the 5th annual edition of this marathon. Today (Saturday, August 3, 2013) we celebrated the start of our 11th year in Modesto, California. To kick off the celebration we were supported by Allergan (the makers of Botox and Juvederm) to do an educational event regarding Botox and Juvederm. I had two models and we injected Botox into different areas of the face, and then the most dramatic changes were using Juvederm. In many ways, I guess you could consider this an open house. 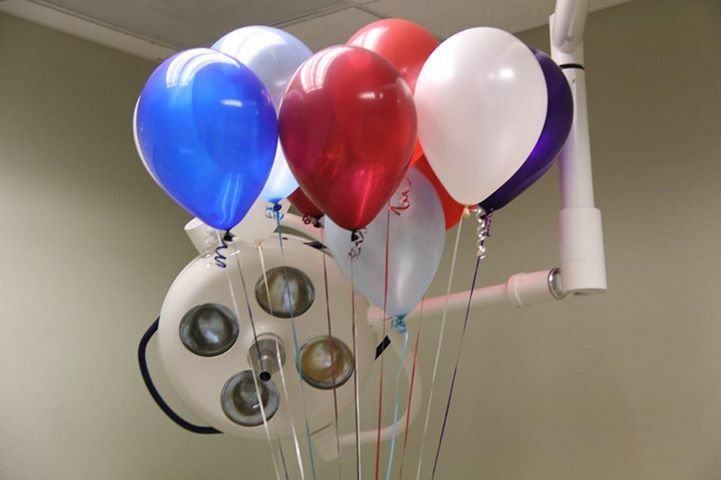 11 balloons to celebrate the start of our 11th year in Modesto, CA. I had originally talked with Allegan – the makers of Juvederm, Botox, and Latisse about having a 10 year celebration. So in essence this was the 10 year celebration of Dr. Tammy Wu and myself (Dr. Calvin Lee) being in Modesto. The first 3 years of this decade were spent at Sutter Gould and McHenry Medical Group (now known as GMMSA – Greater Modesto Medical Surgical Associates) respectively, for the two of us. Allergan’s Northern California Regional Manager presented to me the idea of having a nice lunch and then focusing the event on live demonstrations of Botox and Juvederm. I’ve never done a live demo before of Botox and Juvederm and I was excited by the idea. I’ve heard of other cosmetic practices having done this, but this would be a first for me. I didn’t follow his plan exactly. He had a small admission fee in mind and it was to be set on a work day (Monday-Friday) from 10am-2pm. The admission fee could potentially be applied to a Botox or Juvederm procedure. My reason for that was that Dr. Tammy Wu had already been planning an Obagi event from 9am to 11am – a Saturday breakfast kind of event. And she thought we could Piggy Back onto that event and attract even more people – people who were interested in Obagi and perhaps a separate group of people interested in Cosmetic injections. We thought the two groups of people would be interested in both events. So we combined them and didn’t charge an admission fee and had it on the weekend and extended the hours of the event. Similarly, two months ago we did a Breast Augmentation Open House event sponsored by Mentor with mini lectures by Dr. Tammy Wu, Modesto Plastic Surgeon. We had a turn out of about 30 people, and the advertising method was similar – all via FaceBook. How did I advertise our Botox / Juvederm / Obagi Modesto event? I had advertised this cosmetic event on FaceBook . I advertised to the Modesto area, and spent about $1000 on advertising. I created an Botox Juvederm event page (which was free on FaceBook). But paid for those advertising on the sides and in boosted posts. I had trouble with boosted posts for some reason and never really figured out the reason. I’ll have to put in a query to the facebook posts. But I’ve had trouble in the past with plastic surgery type advertisements in FaceBook. The free event page received 124 “going” guests – I think that’s a great way to spread the word. I have three FaceBook accounts. Personal FaceBook – for just about everything in my life. Surgical Artistry FaceBook – for Surgical Artistry and Dr. Tammy Wu. 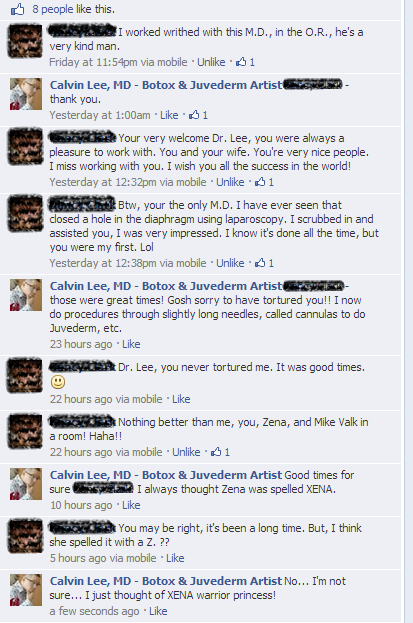 Botox and Juvederm FaceBook – for my Botox and Juvederm practice. We got about 60 guests as estimated by our Surgical Artistry staff. I was pretty impressed. I think about 90% of the patients were new to the office. We offered specials on Obagi as well, and I’m sure this was partly a draw – so not everyone was here for the Botox and Juvederm demonstration. We had great food catered by DEWZ Restaurant. The food and amount worked out well. We had requested food for 30 people for the catering. In the past we had reserved for 60 people (we used Surlas before), and that was too much food. You can get overwhelmed with food. Back to the topic of DEWZ, Judy, one of the owners of the restaurant came herself to make sure the process went smoothly. We are very appreciative. People were able to walk in and out of my procedure room. I think I heard that the injections into the lip seemed a bit much for patients – it just seemed somewhat “scary” perhaps. Perhaps lip injections weren’t the best public demonstration. Regardless, many patients stayed for the demo and I think they learned a good deal and some of them even signed up for cosmetic injections. When we counted up the results, we pre-sold 500 Units of Botox and 19 syringes of Juvederm. We had about 60 guests come to visit. 27 of the guests purchased something – either Obagi, Botox, Juvederm or Latisse. Thank you very much for coming to our Botox / Juvederm / Obagi event. We truly appreciate the tremendous support. Empty Botox bottles I’ve collected in Modesto, CA. I have much more, but my staff made me put them away. Having a sign in sheet may improve the flow of the event for those waiting for the Obagi Rep who did free personalized skin care analysis with the reveal machine. Having catered food for 30 people was enough. It is possible to do all the advertising through FaceBook without tapping into our email list – especially if the goal is to introduce the practice to new patients. We love having many establish patients come by to mingle and talk about us with the new potential patients. Most folks don’t come right at the beginning of the open house. The popular time is around 10am or later it seems. A shorter open house between 10a-2p might be a new possibility and this could possibly be done during a work day instead of a Saturday. 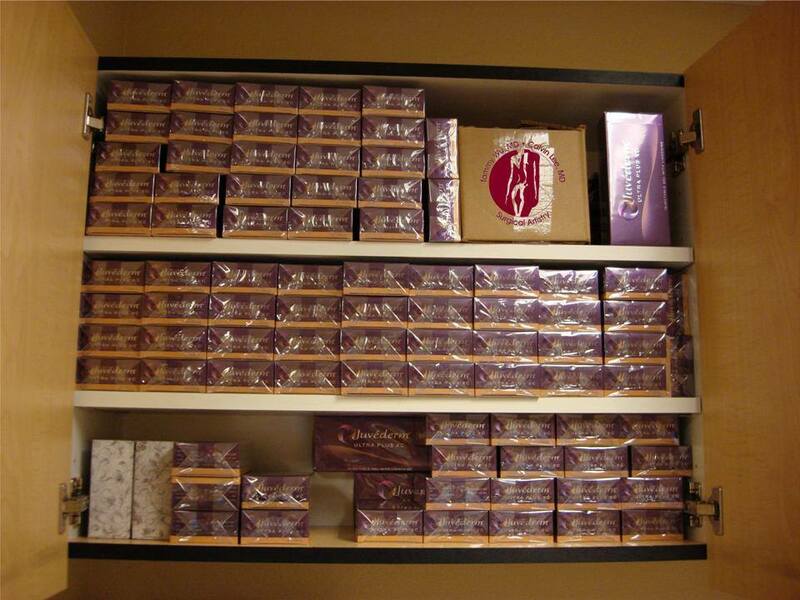 My Modesto stash of Juvederm Ultra Plus XC. Lessons from a previous Plastic Surgery open house – how you can spend $4000 to create the event – I wrote this several years ago. It was meant as a chance for others to learn from our events and also as a source of notes for myself. My continued struggles with plastic surgery advertising on FaceBook. The challenges are targeting requirements, and possible rejections based on their criteria for “text” as part of images ie. Botox logo or Obagi logo have too much text for FaceBook. And they do not take before and after pictures as part of advertisments, and they sometimes classify breast implants as sexual aids and sometimes Botox as illegal drugs. Summary of the event pages used on FaceBook for my previous events. I didn’t include our Surgical Artistry Modesto Marathon event pages here.